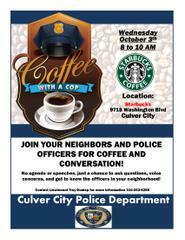 Coffee with a Cop---October 3rd, 8-10am "Starbucks" 9718 Washington Blvd. Coffee with a Cop----October 3rd, 8am to 10am. "Starbucks" 9718 Washington Blvd.